Have you ever seen those strange ERC letters accompanied by some odd numbers? Never understood what they stand for? Cool – we’ve written this article just for you. ERC means “Ethereum Request for Comment”, but never mind that. We’re here not to give you a master’s in blockchain tech, but to explain the basics, so that you can tell one popular type of token from another and brag to your friends. ERC-20 is the most well-known and widespread token standard on the Ethereum blockchain. ERC-20 tokens are fungible, i.e. totally interchangeable, which means that you can replace one by another of the same kind, and nobody’s going to notice the substitution. The fungibility of ERC-20 is usually explained by comparing them to two other fungible, very familiar things: banknotes and metal coins. It doesn’t matter at all which particular $5 bill you use to pay for that sandwhich, cause they all carry the same value. Gameunculus likes to say that ERC-20’s are like every hair on his back. Wait, wait, isn’t every hair unique? Well, not if it’s created with a Photoshop hair brush tool. Gameunculus: breaking the 4th wall. He’s the Deadpool we all deserve! How do crypto games use it? ERC-20’s are used as internal tokens in many crypto games. WAR FIELD’s GLDR is an ERC-20, as are the IMP of Ether Kingdoms, the Lord Coin in Lordmancer II, Decentraland’s MANA, Enjin Coin (which is supported by the whole multiverse of Enjin games), and many more. ERC-20 tokens are used as in-game currency to buy gear, weapons, upgrades, etc. If you’re dumb (it’s the problem in itself) and send your tokens to a wrong address that doesn’t support ERC-20, they will be gone forever. Wave them goodbye, as you’ve already done your childhood dreams, your girlfriend, and any chance you had at a decent life. Making new tokens is extremely easy, that’s why the Ethereum blockchain is most popular for ICOs — any project can create their own ERC-20. Each ERC-721 token is unique. Like fingerprints. Like snowflakes. Like hot chicks on Instagram. Well, perhaps, this last example is questionable. ERC-721 are also indivisible — you can’t send a part of your token, only the whole. All your favourite collectibles are ERC-721, actually. Kitties, Cuties, baseball players, planets, dragons, bananas on bikes. With ERC-721 tokens, crypto games make you feel sure that the asset truly belongs to you and you can sell or transfer it at any time you like. Every feature of your collectible is also saved on blockchain; for example, the genome of your Crypto Kitty, the level of your collectible character or its special abilities. Every valuable, unique asset can be put on the blockchain easily and securely with ERC-721. It carries more detailed information than ERC-20. ERC-721 transfers are not very efficient. You need to make multiple transactions to send multiple tokens. Imagine that you go shopping and have to pay for every single egg separately: you get nervous and the queue behind you is ready to kill you. Then you remember that your wife wanted some grapes, and you steal it using people around you as hostages, cause paying for every single grape berry is far less bearable than going to prison. ERC-1155 is kind of an improved version of ERC-721. Just like Big King is an improved version of Big Mac, or your girlfriend is an improved version of your Mom, or friend. Have to finish with these food analogies, cause my mouth is watering. So, the ERC-1155 token standard was created by Enjin to solve the problems of the ERC-721 standard (that thing with paying for eggs and grapes), and it seems like they succeeded. In crypto games, an ERC-1155 acts just like an ERC-721, but with some added bonuses like single contract storage for multiple items and one-at-a-time trading. Why’s this cool? Cause you don’t need to pay gas fees for every single transaction of every single collectible! Since it was created by Enjin, it’s supported by all Enjin games. War of Crypto heroes, handy cats in Cats in Mechs, and CryptoFights warriors are all ERC-1155. 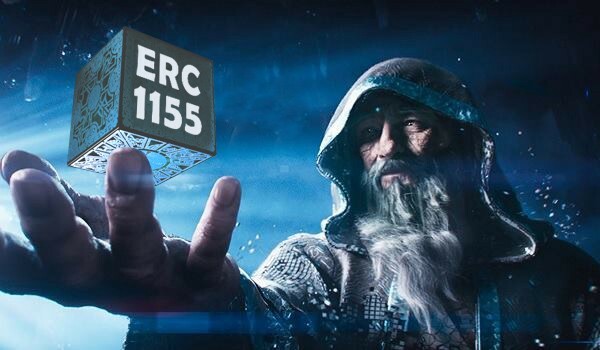 ERC-1155 overcomes the drawbacks of its forerunner and makes collectible transfers faster and cheaper. With the Enjin Mintshop you can create your own ERC-1155. Your ERC-1155 can be used all around the Enjin game multiverse (in different games!). Enjin games are still in development or in a pre-sale stage, so we can’t access the benefits of ERC-1155 right now. Now, once you’ve learnt all this useful stuff, Gameunculus can treat you as an equal. Come and share your opinions on our Telegram channel or Discord chat.